BMW has announced the all-new second generation 1 Series. It’s set to go on sale in September, priced from £19,375 on the road. 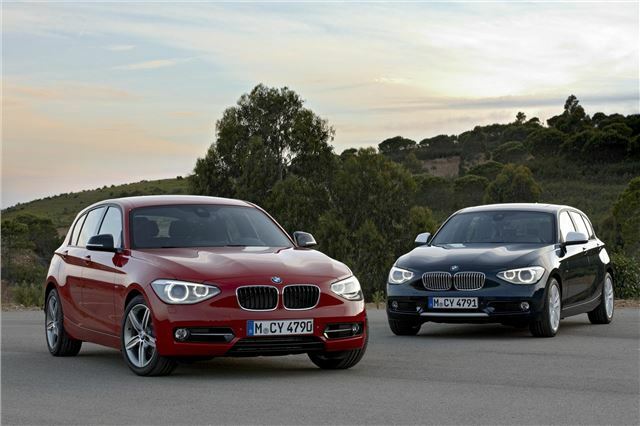 The new model is longer and wider than the outgoing 1 Series, which improves interior space. It remains the only rear-wheel drive car in its sector. Drive comes from TwinPower engines – two petrol and three diesel. The entry level 116i petrol produces 136hp, with a combined mpg figure of 49.6mpg. There is a more powerful 118i petrol, which makes 170hp with economy of 47.9mpg. The diesel engines all produces less than 120g/km of CO2, placing them in band C for VED, with a BIK rate of 13% for company car drivers. All of the diesel engines are capable of 62.8mpg on the combined cycle. The 116d, 118d and 120d produce 116, 143 and 184 horsepower, respectively. All engines are fitted with a twin-scroll turbocharger to increase efficiency and improve performance. The 1 Series will be available with either a six-speed manual or eight-speed automatic gearbox, the latter of which can be specified in Sport configuration, which adds shift paddles and offers a more dynamic gearchange. The styling is described by BMW as ‘youthful and lively,’ and looks much like a dynamic evolution of the outgoing model, albeit bolder and more aggressive. The lights are more angular and the wheel arches wider. The new design is also more practical than that of the outgoing model – the rear doors are wider and allow easier access, and the wider, longer stance improves cabin and boot space. EfficientDynamics technology is standard across the range, and includes a stop/start system and an ECO PRO drive mode, which alters throttle response and encourages economical driving. Eventually the range will be expanded with a 116d EfficientDynamics model, which will be capable of sub 100g/km CO2 emissions, while delivering 116hp and 74.3mpg. Inside, rear legroom is improved by 20mm, and there are 30-litres of extra luggage space. In typical BMW style the centre console and controls are all angled towards the driver. High quality, precision finished materials have been selected to trim the interior. Split/fold rear seats are standard, as is a leather steering wheel and keyless start. iDrive is standard in SE trim and above. This system consists of a centre console mounted controller linked to a 6.5-inch screen. The screen displays all information for entertainment, telecommunications and navigation functions, should sat nav be specified. Sports and Urban packages add various interior and exterior styling accessories, including additional bumper trim, interior colours and interior trim enhancements. The basic 116i starts at £19,375, while the 118i starts at £21,985. The most basic diesel, the 116d, costs from £20,195, the 118d from £22,030, and the 120d from £23,480. The new 1 Series goes on sale in the UK on 17 September 2011.